Anim Graph supports extending it by defining and using custom nodes. 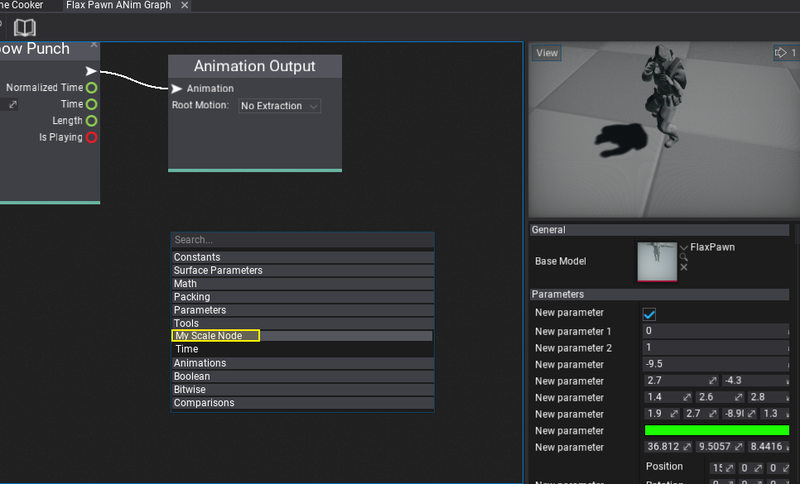 This feature can be used to implement custom IK solver or to perform very specific animation data processing or using custom animation data source such as live-rigging. Follow this documentation page to learn more about how to create and use custom nodes in Anim Graph. Also, plugins can ship with custom nodes to be reused across different projects. Anim Graph uses low-level optimizations to reduce memory allocations and memory copies. Extending it with custom nodes requires basic knowledge about unmanaged memory pointers usage and skinned model skeleton nodes/bones scheme. Every custom node consists of two parts: the surface node descriptor factor and the runtime logic controller. The first step is to add a new class to you Editor scripts assembly (in Editor subdirectory located in Source folder). Here is an example code that defines a simple node which takes animation pose and scale parameter as inputs and outputs modified animation pose. In general, classes in Editor assembly or Editor plugins assemblies marked with AnimationGraph.CustomNodeArchetypeFactory attribute are scanned to find static parameter-less methods that return NodeArchetype type. You can define many node types in the factory. If your custom node doesn't show in the editor or doesn't work as intended see the engine log file for warning information. Next step is to implement runtime-part of the node that is being executed in the game (node factory is used only in Editor to define node data and UI). Add the following class MyScaleNode to you game assembly. The last step is to test the created custom node. To do so simply right-click and select you node from the list or type to search by name.